Many do not realize that doula trainings are not all the same. With over 80 different organizations certifying doulas these days, you really need to do your research! We provide DONA Approved Birth Doula Workshops, but even knowing what organization you want to certify with, how do you find a training? Each trainer, even within DONA, creates their own curriculum, courses can vary immensely while providing the same educational basics. I was surprised at the end of my birth doula training to find that Heather Crossan was planning on staying in touch and supporting us. It felt so good knowing that as I started this new journey I had someone backing me up, encouraging me, and willing to sit down and run through questions with me. Even though I am not in the Calgary area, I appreciate the community and support DE supports, from basic questions of info, opinions and backup for clients. I love it. I also love the standard of professionalism DE models for their doulas and the focus on scope of practice. I am proud to be a DE trained DONA doula - so much so that I am willing to travel for advanced training. Doula Essentials is a warm, supportive, and great community to learn in. I love the clarity the mentors bring regarding healthcare boundaries for doulas and feel that I can be much more successful by understanding where my role starts and stops. What really stands out to me is that I've only met Heather a couple of times, (at two different training events) and haven't even met Lori but I feel like we're friends because that's the type of community they are building. I'm so grateful that I stumbled upon this community by choosing DE as my training! The Birth Doula training I received from Doula Essentials was over and above what I was expecting! The DE community has been there for me when I had questions, was second guessing myself and to lift me up when I needed it, and I am forever grateful for all the beautiful souls I’ve met along the way! I can’t wait for my next workshop!! 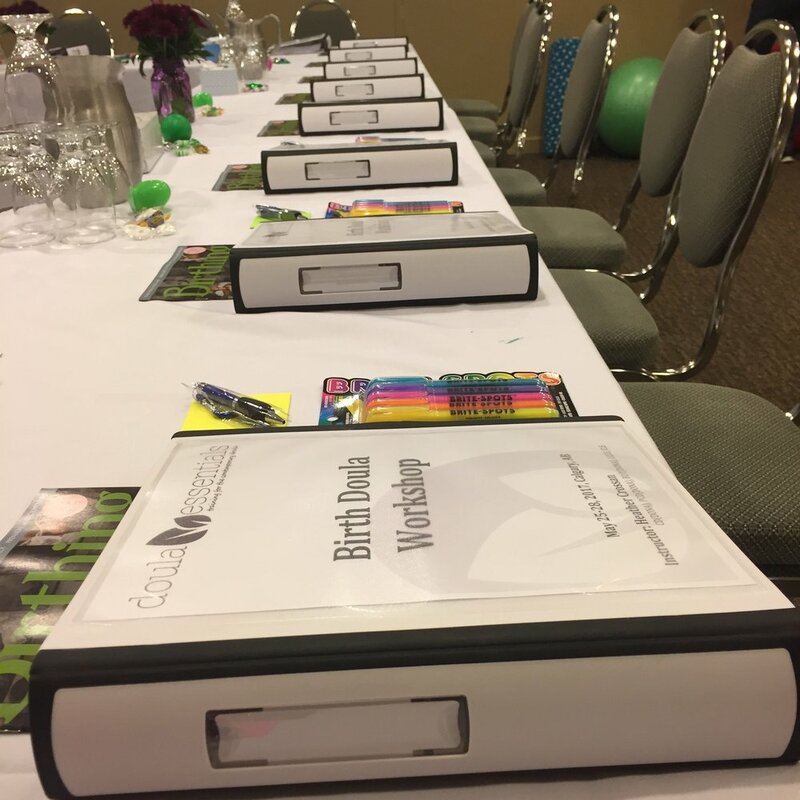 I chose to do my Birth Doula training with Doula Essentials after hearing so many Doula's passionately recommend the engaging and applicable evidence based material. With the ongoing support and opportunities to complete my certification, I feel like my training didn't end in the classroom. The Doula Essentials community supports and empowers one another's experiences and success.Its an extra resource I confidently share with clients and one of the many reasons I continue to do my training with Doula Essentials.